Rabbits make excellent house pets: they are intelligent, friendly, clean and quieter than dogs and cats. Traditionally kept in the garden, more and more bunnies are coming in from the cold and living indoors with their human family. “Rabbits of any age will adapt quickly and easily to being house rabbits” says Lulu James, Director of Cottontails. If you have a garden or balcony, they can exercise outside in the daytime with supervision, and enjoy the best of both worlds. Keeping your rabbits indoors is not just better for them, it’s better for you! Indoor rabbits are sheltered from predators and weather extremes. They get more exercise than garden rabbits, who usually live in just a small hutch and run. They are considered family pets and not just children’s pets. All family members become involved in their care, which teaches children responsibility. Indoor rabbits spend more time with their caregivers and become tamer and more affectionate. 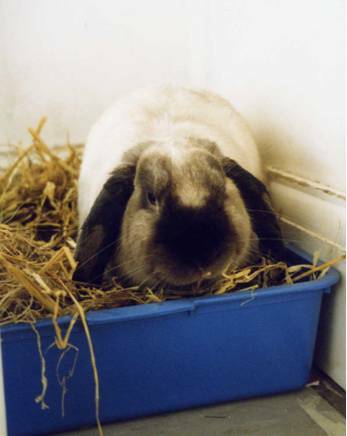 They are less likely to be lonely and neglected, which is the fate of most outdoor rabbits. They enjoy the same status as other household pets and receive better veterinary care – in contrast many outdoor rabbits die of untreated illnesses. They live longer: the life expectancy of outdoor rabbits is about a year, of house rabbits 7-10 years. Rabbits sleep at night and most of the day and are active first thing in the morning and in the evenings, which makes them ideal pets for working people. If you are at home during the day, they are wonderful company and like nothing better than to sit under your chair or next to you to be petted. It’s easier to provide for your rabbits’ social and physical needs (feeding, cleaning, grooming, company, exercise) indoors than in the cold and rain. You are more likely to get to know your rabbits and bond with them if they live with you. People who keep their rabbits outside often don’t realise how affectionate and entertaining they are and miss out on the best part of having a pet. If you are considering bringing your rabbits indoors, even if it’s just some of the time, all you need to know is in our Bunny Basics guide.